One could pass by the intersection and miss it. It’s tucked away behind a plethora of enjoyment options available to residents. The 29th Street Mall begins across the street and Home Depot stares back too. Harpo’s Sports Bar sits on this side of road as you cross the street and a City of Boulder fire station sits on the corner of interest. Even in the park beside the intersection, there is a flurry of entertainment options. A playground for children sits not far away. A rocket towers above all else for the kids to climb. Beyond that, a field lies open for anyone to use. Various sporting activities are often housed there, with people throwing footballs and Frisbees. Some even play cricket. Nearby, a water park waits for the public. A large, yellow waterslide erupts skyward, with what appears to be a lap pool available too. For now, the concrete remains dry — closed for the season. Finally, one may turn his or her eyes to the main attraction. It doesn’t pop out as much as a rocket or water slide, but it’s the most vital terrain here: Scott Carpenter Field. The baseball diamond and grass don’t have much that stand out about them. A rubber batter’s box and home plate are used, likely as a way to ease the ground crew’s job. The grass is green, an impressive feat this time of year. Nothing special is etched in the outfield. There isn’t even a diamond pattern. The grass is even. It’s simple. It’s humble. It’s where the University of Colorado’s baseball club team practices. This is where the players will hone their craft. It is where the managers will get to see what strategies they have at their disposal. It is a place that is critical to the success of the team. It seems so odd. The university does not own the field. It doesn’t maintain the field. The field’s not related to CU Boulder at all. The local high school team also practices here, and likely has more credibility with the people managing the field. But here is the ground on which the baseball team will improve. 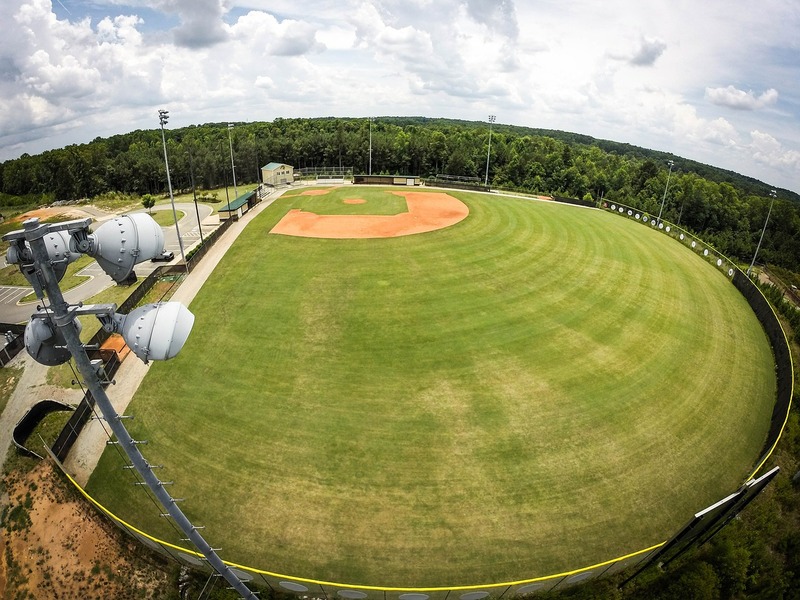 Every team has to practice on some baseball diamond, and every team utilizes their fields differently. Some do scrimmage activities. Base running is a crucial aspect of the game. Others may do offensive drills of sorts. Defense, however, remains king in practice. Most teams realize this importance, but it’s important to point out. Defense is critical to how a team stops points from going on the scoreboard. Players have to put their bodies on the line to make spectacular plays, diving to grab a far-away ball. Sometimes, a runner, sprinting to a base, must make a decision in a fraction of a second. The Colorado club baseball team is aided in their goal for better defense with a well-kept park. The field, as previously stated, isn’t a university property. Instead, the city of Boulder owns the park in its entirety. City employees are the ones that keep the field nice and tidy. The players really value what they do, especially before games. The outfield already looks to be in pristine condition, though spring has only just officially started. That’s a testament to the hard work the grounds crew does. Instead of just having green grass, the surface is even. It should be noted how important a flat outfield is. Mickey Mantle famously tripped after catching a piece of the sprinkler system. There’s speculation that his ACL may have been torn on the play. Back then, there was no way to treat that like there is today. The superstar played the rest of his career without this injury properly healing. Mantle is already one of the greats of the game, but many wonder what could’ve been had this not occurred. The offensive side of the ball is important too. For the club baseball team, Scott Carpenter makes it hard for everyone to get a chance at this crucial aspect of the game. Instead, the team utilizes the turf field in the campus rec center. Right before the team took the turf field, a soccer match was being held on it. It’s a rectangle environment with a lower ceiling than the rest of the rec. How is any baseball supposed to get done here? Any hopes of a turnaround from a poor outing last season begins at Scott Carpenter Field. It is also where the team hosts opponents for games in Boulder. Colorado’s last scheduled matchup, against CSU, is a home game. So, it may also be where that hope ends. Contact CU Independent Managing Editor Jake Mauff at jacob.mauff@colorado.edu and follow him on Twitter @jake_mauff.